New polling for IPPR has important implications for the UK’s choice post-Brexit to either align with or diverge from EU standards. The polling conducted for IPPR by Opinium shows there is strong public support for either retaining or strengthening EU-derived standards. The polling is published today in a new briefing paper on public attitudes to Brexit by IPPR, the progressive policy think tank. The scope of any trade agreement with the EU is contingent on the extent of future regulatory alignment, so the choice facing the government is critical. If the UK does diverge from EU rules and standards post-Brexit, it would need to find another country or trade bloc to which it can align, the most likely option being the US. But the polling shows that across a range of consumer, financial, employment and environmental legislation, a considerable majority of the public want to keep the current standards in place, or go further than the minimum requirements specified by EU legislation. Only relatively small proportions of the public are in favour of reducing or removing standards: 14% want to either loosen or remove the current Working Time Directive rules, and only 9% want to raise or remove the cap on bankers’ bonuses. There is strong support for EU-derived standards among both Remain and Leave voters. For instance, only 5% of Remainers and 5% of Leavers support the loosening or removal of consumer cancellation rights. There is only 17% support for loosening or removing the Working Time Directive among Leavers. In fact, in some areas the public supports stronger standards - most notably, in environmental policy and financial regulation. 58% support a tougher cap on bankers’ bonuses, while 48% support stringer renewable energy targets. In each of these cases, the strongest support for tighter regulations comes from different demographic groups. In the case of renewable energy targets, there is particularly strong support for tighter regulations among 18-24 year olds and Londoners. In the case of the cap on bankers’ bonuses, there is particularly strong support among older and retired groups. Therefore, while the vast majority of the public is in favour of high standards, there are some differences among respondents on particular issues, with young Londoners appearing to favour greater environmental protections and older respondents appearing to favour tighter regulations targeted at financial elites. “Our research shows there is no appetite for deregulation post-Brexit. Regulatory divergence is both anti-worker and anti-business—so it should be no surprise that the public don’t want it. In a series of two briefings, this being the first, IPPR will explore the public’s perspective on this choice by detailing the results of new polling on attitudes to EU regulations and a range of critical Brexit trade-offs now facing the country. 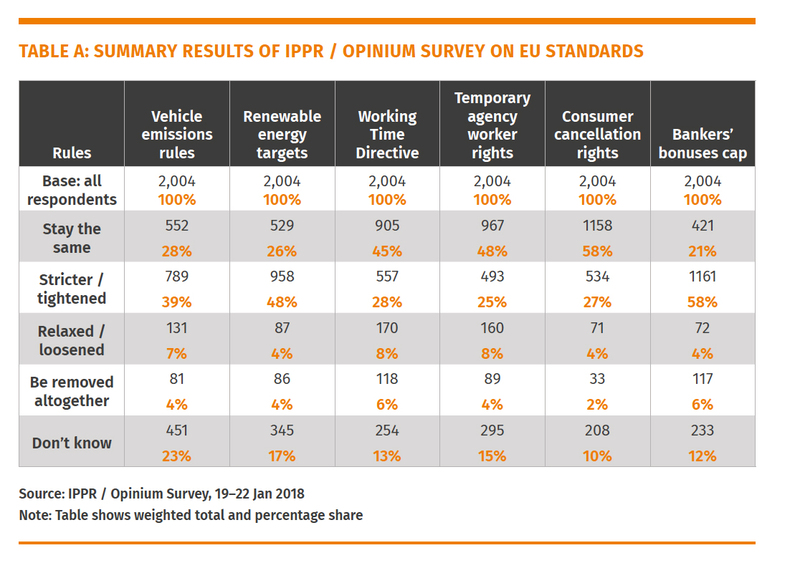 For the first briefing on regulation IPPR surveyed the public on whether they wanted to retain, tighten, loosen, or remove a range of EU regulations, relating to key areas of consumer, financial employment and environmental policy. This focused on six examples of EU standards and regulations that underpin the European economic and social model. There were two questions on environmental standards: one on reducing greenhouse gas emissions from vehicle fuels, and one on binding renewable energy targets. There were a further two questions on employment standards: one on the Working Time Directive and one on temporary agency workers’ rights. Finally, there was a question on consumer rights – specifically on the right to cancel the purchase of goods that haven’t been seen in person – and a question on financial regulation – specifically on bankers’ bonuses.